Brolucizumab (RTH258, Novartis) demonstrated noninferiority to aflibercept (Eylea, Regeneron) in the primary endpoint—mean change in best corrected visual acuity (BCVA) from baseline to week 48—in two phase 3 studies in patients with neovascular age-related macular degeneration (AMD).1 Pravin U. Dugel, MD, presented the results of the two trials, HAWK and HARRIER, at the 2017 American Academy of Ophthalmology (AAO) Annual Meeting in New Orleans. The investigational drug also demonstrated superiority to aflibercept in key retinal health outcomes and long-lasting effects in patients. In the 96-week prospective, randomized, double-masked multicenter phase 3 studies, patients were randomly assigned to treatment with the humanized single-chain antibody fragment brolucizumab or aflibercept. Immediately after a 3-month loading phase, patients in the brolucizumab arm received treatment every 12 weeks, with an option to adjust to an 8-week dosing interval based on masked disease activity assessments at defined visits. Aflibercept was given bimonthly, according to its labeling. At week 16, relative to aflibercept, 35% fewer patients receiving brolucizumab 6 mg showed presence of intraretinal fluid (IRF) and/or subretinal fluid (SRF) in HAWK, and 33% fewer in HARRIER (P < .0001 for both comparisons). At week 48, relative to aflibercept, 31% fewer patients receiving brolucizumab 6 mg had IRF and/or SRF in HAWK, and 41% fewer in HARRIER (P < .0001 for both). Additionally, patients receiving brolucizumab 6 mg demonstrated superior reductions in central subfield thickness. With brolucizumab, significantly fewer patients had active disease at week 16 in a matched head-to-head comparison. Safety of brolucizumab was comparable to that of aflibercept, with overall incidence of adverse events balanced across all treatment groups in both studies. 1. Novartis brolucizumab (RTH258) demonstrates superiority versus aflibercept in key secondary endpoint measures of disease activity in nAMD, a leading cause of blindness [press release]. Novartis. November 10, 2017. www.novartis.com/news/media-releases/novartis-brolucizumab-rth258-demonstrates-superiority-versus-aflibercept-key. The open-label, multicenter phase 1/2 clinical trial is assessing the safety and efficacy of two treatment regimens: suprachoroidal CLS-TA in combination with aflibercept in 10 patients with DME who are naïve to treatment, and suprachoroidal CLS-TA monotherapy in 10 patients with DME who have previously been treated with intravitreal anti-VEGF therapy or intravitreal corticosteroids but still require treatment. A visual benefit was seen in patients receiving CLS-TA, with greater benefit in treatment-naïve eyes. 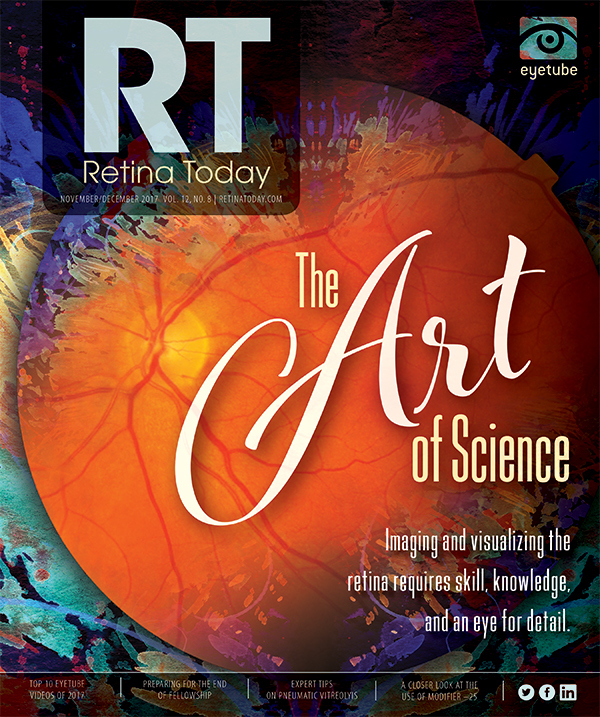 Anatomic improvement was observed in all treated eyes, with more than two-thirds achieving a greater than 50% reduction in excess central retinal thickness through 6 months after initial treatment. Of patients in the treatment-naïve group, 40% did not require retreatment during the 6 months, and an additional 20% required one retreatment. The drug was well tolerated, with a low incidence of ocular side effects. 1. Clearside Biomedical’s phase 1/2 open label clinical trial of CLS-TA with and without Eylea in diabetic macular edema presented at the American Academy of Ophthalmology 2017 annual meeting [press release]. Clearside Biomedical. November 13, 2017. www.globenewswire.com/news-release/2017/11/13/1185058/0/en/Clearside-Biomedical-s-Phase-1-2-Open-Label-Clinical-Trial-of-CLS-TA-With-and-Without-Eylea-in-Diabetic-Macular-Edema-Presented-at-the-American-Academy-of-Ophthalmology-2017-Annual.html. Accessed November 17, 2017. Three years after a one-time administration of the investigational gene therapy voretigene neparvovec (Luxturna, Spark Therapeutics) in each eye, the 20 partici-pants in a phase 3 clinical trial maintained the average visual improvements that were demonstrated at 1 year, the company reported. In the continuing phase 3 trial of this investigational gene therapy in patients with vision loss due to confirmed biallelic RPE65-mediated inherited retinal disease (IRD), the gains were maintained in the modified intent-to-treat (mITT) intervention group as measured by multiluminance mobility test (MLMT) score change, the primary endpoint, and full-field light sensitivity threshold (FST) testing, a secondary endpoint. MLMT improvement measured 1.8 lux levels at 3 years, compared with 1.9 lux levels at 1 year. A more-than-100-fold average improvement in FST observed in the intervention group at 1 year was also maintained through at least 3 years. The increase in visual acuity averaged over both eyes, a secondary endpoint that was not statistically significantly improved at 1 year, was found to be stable for at least 3 years for participants in the intervention cohort, with an 8-letter improvement using standardized visual acuity testing. No new serious adverse events or deleterious immune responses associated with voretigene were observed. In other company news, the US Food and Drug Administration (FDA) Cellular, Tissue and Gene Therapies Advisory Committee unanimously recommended approval of voretigene for the treatment of patients with vision loss caused by confirmed biallelic RPE65-mediated IRD. Also, the company’s marketing authorization application for voretigene was validated by the European Medicines Agency (EMA). The therapy has an assigned Prescription Drug User Fee Act date of January 12, 2018 from the FDA. MediCapture’s 4K ultra-high–definition recorder, MediCap MVR Lite 4K, is commercially available, the company reported in November. According to the company, the device has four times the picture resolution of high-definition medical video recorders. Second Sight Medical Products received approval from German regulators to begin a 10-patient study to implant and evaluate the Argus II Retinal Prosthesis System in better-sighted patients with retinitis pigmentosa or patients who have some tunnel vision. A light-activated treatment for primary ocular melanoma, AU-011 (Aura Biosciences) was generally well tolerated, with no serious adverse events reported in the first six patients to receive the treatment, in an interim report at 3 to 6 months after treatment in a phase 1b/2 open-label trial. The trial is assessing safety and preliminary efficacy in 24 adult patients with a clinical diagnosis of ocular melanoma using ascending single and repeated doses. The most commonly reported adverse events were anterior and posterior intraocular inflammation, which was managed with topical and/or oral steroid treatment. All patients maintained visual acuity. OD-OS announced the upcoming release of Navigate, a framework for remote planning of retinal treatments with its Navilas 577s navigated laser system. According to the company, Navigate will be available in 2018 as a mobile app that will work with various local and remote connectivity packages for the laser. The app will allow multiple physicians to plan treatments from any remote location on a preferred diagnostic image (eg, fluorescein angiography, optical coherence tomography) without requiring access to the laser. The treatment can be simulated in the app to review application of laser spots before uploading the plan. The FDA granted orphan drug designation to LBS-008 (Lin BioScience), a first-in-class oral therapy for the treatment of Stargardt disease. According to the company, LBS-008 works by reducing the amount of circulating retinol binding protein (RBP4) and vitamin A1 (retinol), reducing excess uptake into the eye and preventing the formation of toxins associated with macular degeneration.